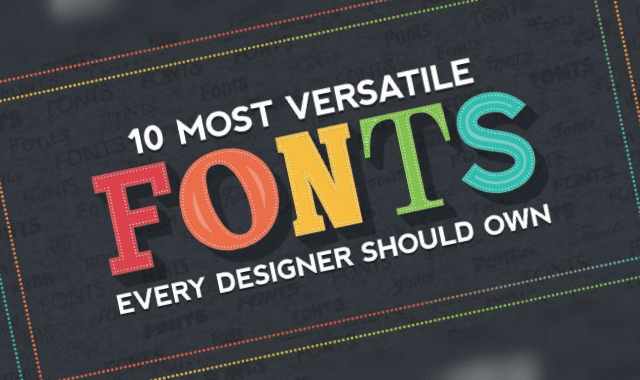 10 Most Versatile Fonts Every Designer Should Own #Infographic ~ Visualistan '+g+"
Fonts are one of the most crucial aspects of design. Using the right font brings order to the design and helps deliver the message without chaos or confusion. The versatility of fonts is important to keep brand's message consistent across screens. Versatile fonts adapt to their environment (in terms of size, letter spacing, thickness/thinness and orientation) to ensure that designer does not have to struggle with the content. Here are some of our favorite fonts that are not just quick to adapt but also come handy in variety of applications. Check out!